I was going to wait at first, but nyxie was getting her nose done today, and while I was waiting in the lobby of Yonge St. Tattoos I asked the girl at the counter a bunch of questions and convinced myself to just go ahead and do it. I need more spontaneous and less planned and researched anyhow. 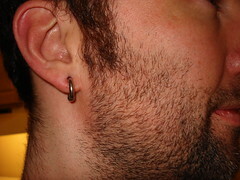 Robin did the piercings and was great, very careful to explain the precautions and procedures and just generally friendly. I'll definitely go back there for stretching and any other holes i might want. The actual piercing went fine, I felt a bit light-headed afterwards but a bit of reclining and a juice box (hee) took care of that. No big NYE plans tonight, just staying in with nyxie. We've got some horse doovers and a bottle of sparkling wine and a six of Dogfish Head IPA to get us through! Dogfish Head! That's such good stuff. I don't have a Dogfish Head icon, so here's the Long Trail Ale one. And happy new year to you, and congratulations on the piercing. I need more spontaneous and less planned and researched anyhow.